This is my I Am From poem which I created for Humanities. I used GarageBand for the voice recording and StoryBird to develop the story and illustrations. iMovie was used to pull it all together. My finished product came up so much better than I had expected and I’m very interested in looking to sell these to raise money for a charity such as Plastic Oceans whose mission is to raise awareness on the issue of plastic pollution. 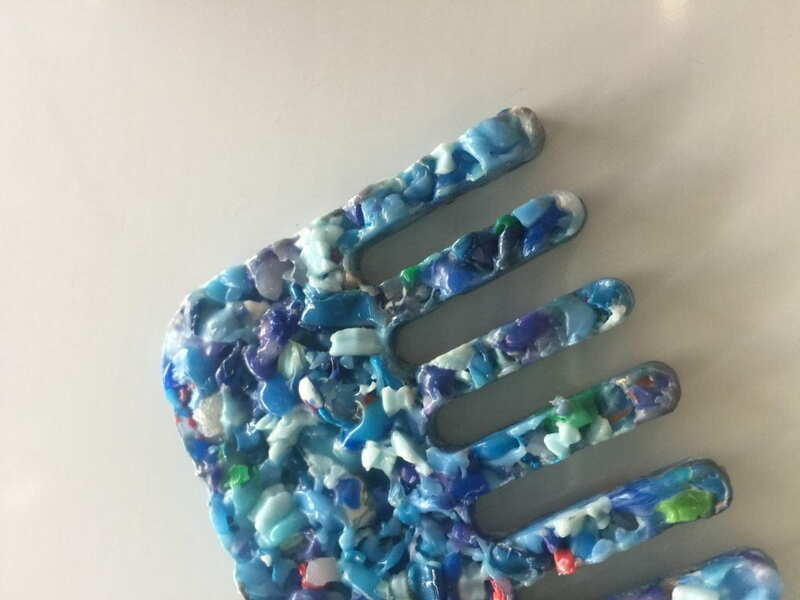 Single-use plastic is a human addition that is destroying our planet and I want to do everything I can to be a part of making this much-needed change. From the two successful plastic cakes, I made over 15 individual combs. I chose colours that were quite different from each other with the hope of gathering interest from a wider audience. 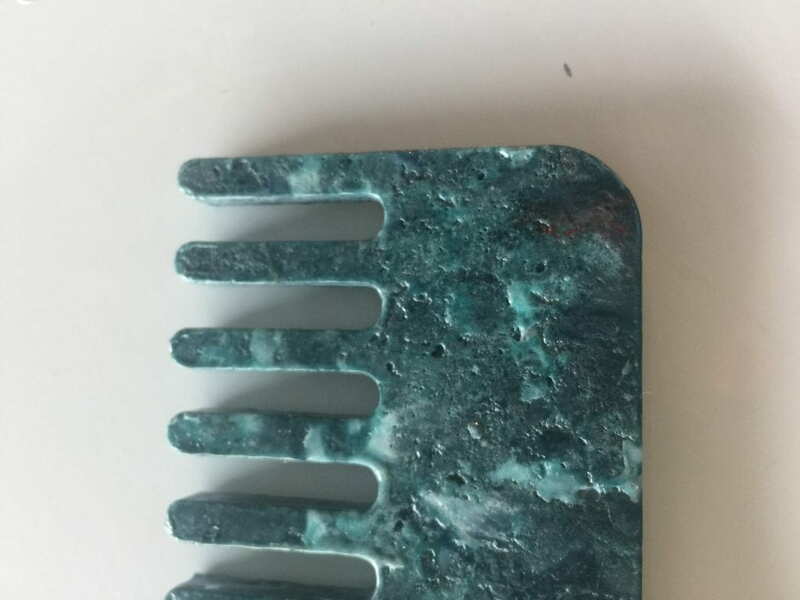 The green/blue combs, I think, turned out the best as the sheet was flat and allowed to cool overnight. 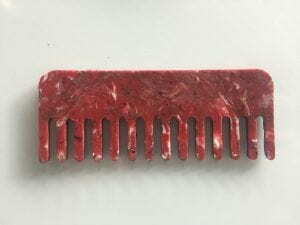 The red coloured sheet wasn’t as flat so I did have some difficulty cutting this and as a result, the combs from this sheet have a slight bend in them. 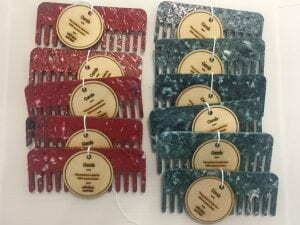 Please buy a comb from the PTA store to support Plastic Oceans and increase awareness of an important global issue! The first plastic cake that I made was flat on the top but was not properly melted when I removed it from the baking dish. This was frustrating because it was not something that I could go back and correct. I did cut a comb from this plastic sheet to get an idea of how the illustrator design would cut. So it wasn’t all a waste! I created a second plastic sheet/cake and this time, I left it in the oven for almost an hour. This meant that I had to cover the top after about 45 minutes to prevent the sheet from burning. Once I removed the sheet from the oven, I used clamps to ensure the sheet would harden completely flat. This would make cutting so much easier as I would be able to ensure the cut was the whole way through the plastic sheet. Being patient and waiting for the sheet to cool completely was really important! With a second plastic sheet I made, I didn’t wait for it to cool completely and as a result, the thickness was not consistent and I had trouble cutting with the laser cutter. I also found that using baking/greaseproof paper to stop the sheet from sticking to the baking dish left an annoying sheen on the plastic. I was able to use a heat gun to carefully heat the surface to melt it again, only slightly! 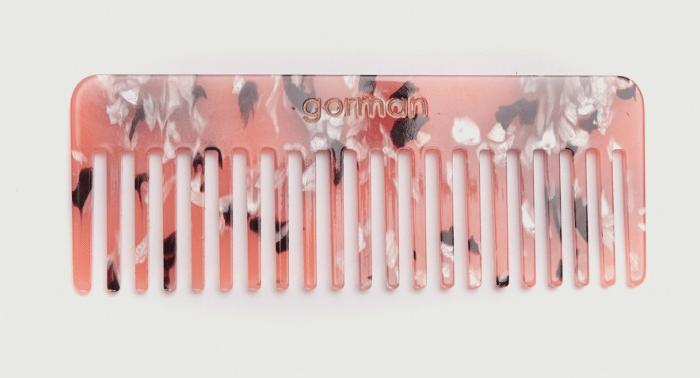 When I first tried this, I heated it too much and found that the teeth on the comb started to warp. Whoops! 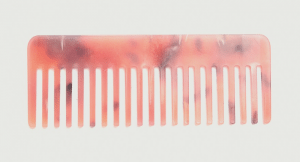 With the next comb, I made sure to keep the heat away from the teeth and only heat the surface very slightly. 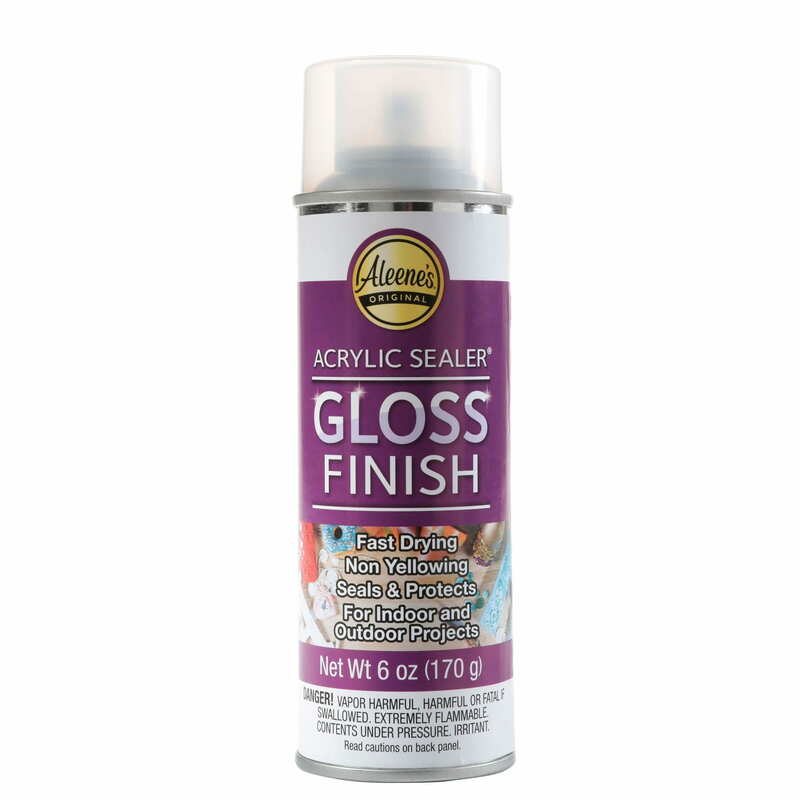 This gave the plastic sheet a gloss once again. To further improve the sheen of the fished product, I sprayed them with an acrylic gloss to protect the comb and also improve the appearance. The gloss finish did take a while to dry and I had to leave them overnight but it was worth the wait! 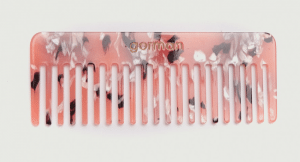 The gloss changed the overall appearance quite significantly and the material to touch was smoother and felt more like the comb that originally inspired my idea. 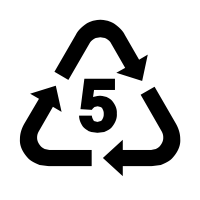 Having spent some time researching the Precious Plastics website, I know that I am best choosing one type of plastic to work with. I’ve chosen to create a plastic “cake” made from type 5 plastic which has been chipped using the shredder machine. I used the Noun Project to find an icon that I can use to prepare an Illustrator file for the purpose of laser cutting the plastic sheet/cake. I’m not all that familiar with Illustrator so I’ll need to develop my skills in this area. 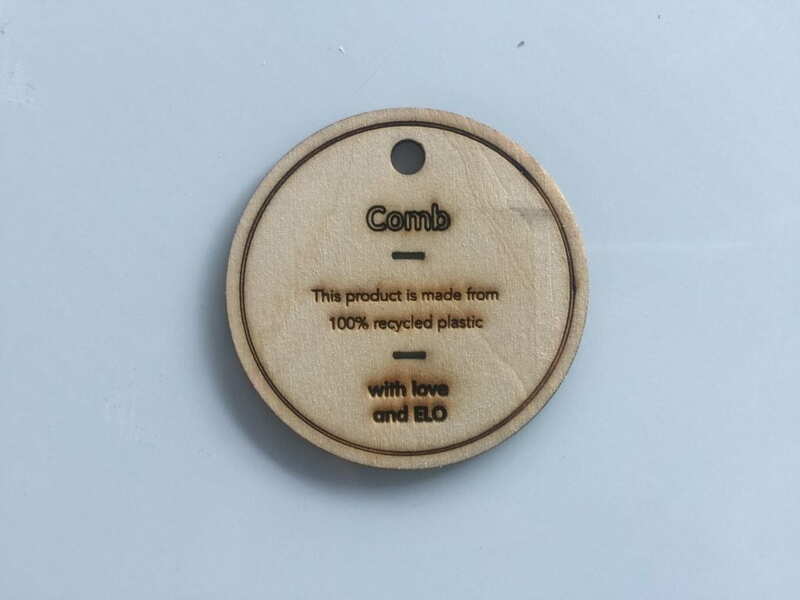 I’m also very new to using the laser cutter and I’m not sure I fully understand the difference between the speed and power when cutting various materials. I’ve found some tutorials online to help me develop these skills and I will also work with Mr Stenning to support me in using the laser cutter. When selecting the icon from the Noun Project I had a number of different options such as these below. 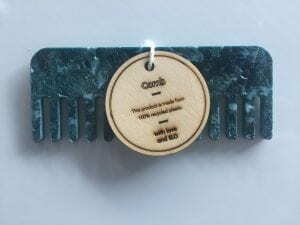 I had to think about which would be best to cut – for example, if the teeth on the comb were too narrow, would there be a chance that they could snap easily? I ended up going with the first icon since it appeared that it would offer a stronger product overall and additionally, it was very similar to my original inspiration for the comb. 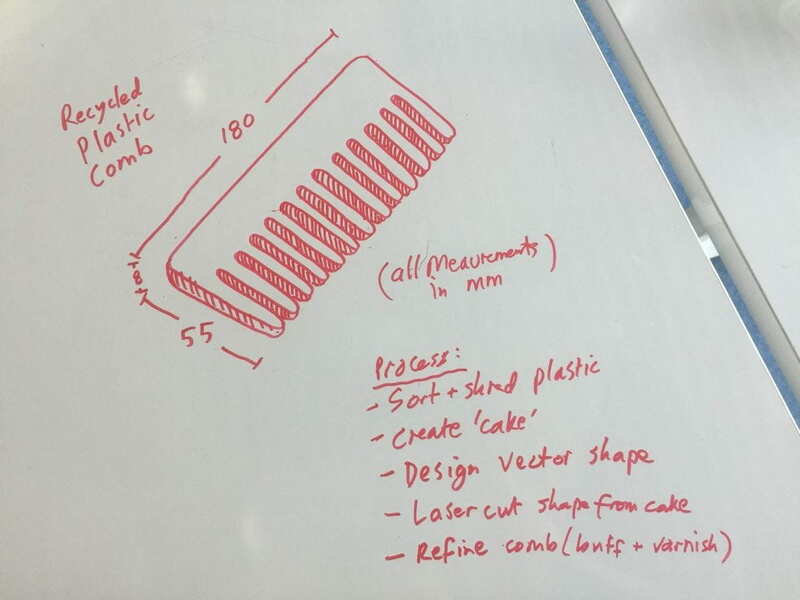 This is my sketch that includes my thinking about the dimensions (in mm) for the comb. I’m happy with my design and I think I’m ready to start creating plastic sheets from the shredded plastic. Plastic waste in a huge problem around the world. At ISB we are collecting plastic to use in our Precious Plastics recycling plant in the Fab Lab. 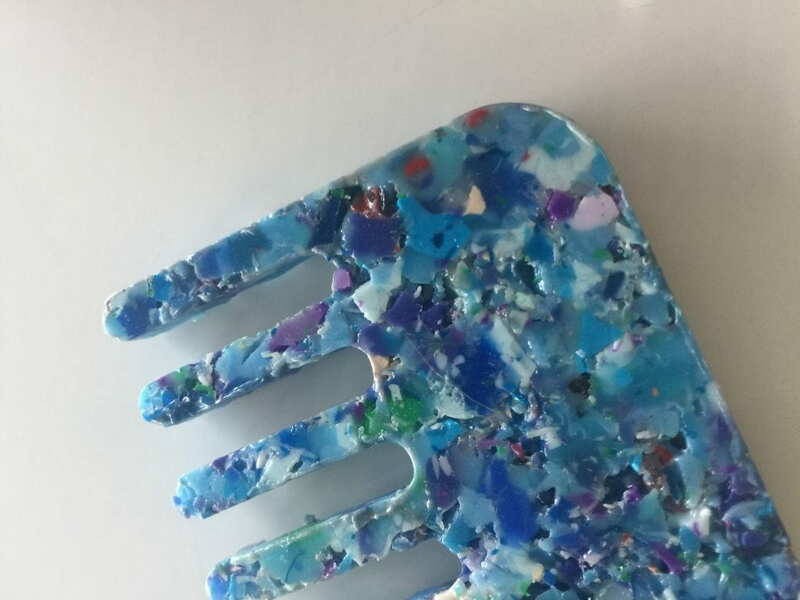 I wanted to take this opportunity to create something from waste plastic which could potentially be sold in the PTA store to raise money for a charity and also raise awareness of plastic consumption around the world. 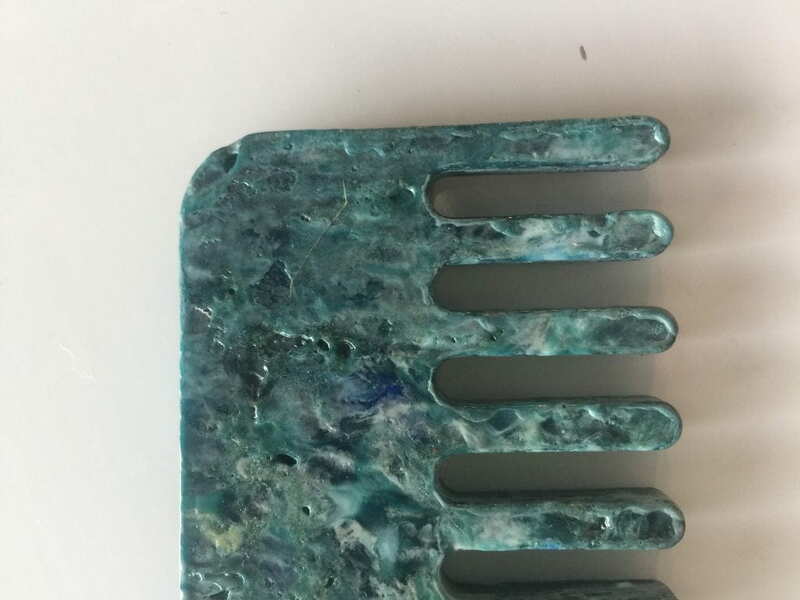 Recently it was my birthday and I was given this beautiful comb. The finish of the comb reminded me of the plastic “cakes” or sheets that I have seen in the Fab Lab, created from recycled plastic chips. This was the inspiration for my project. Upload individual pages (saved to camera roll on iPad and AirDropped to MacBook) one after the next. Be sure you use large as the image size. 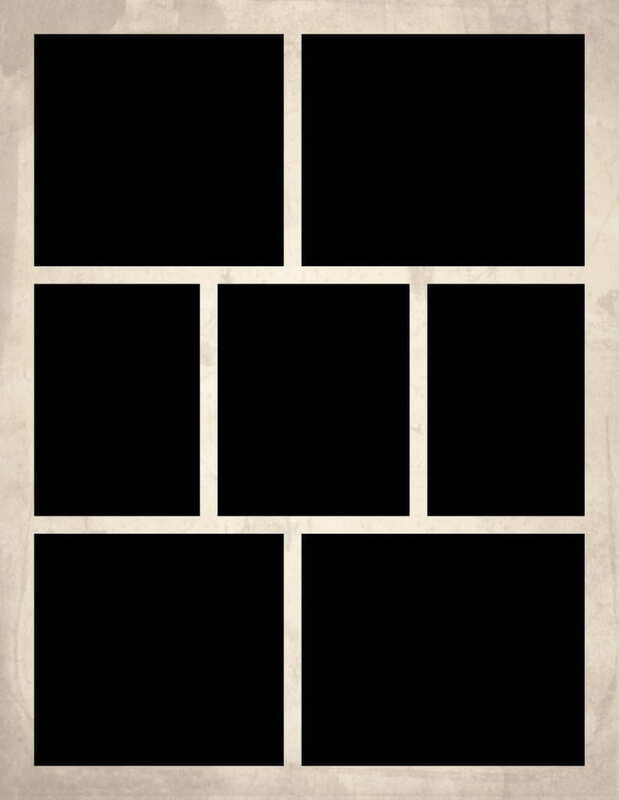 Or create a gallery like this with 2 columns, large size images. Not that every day is not a time for reflection, however, I need to ensure that I spend some time thoughtfully considering my goals I set out to achieve at the very start of the year – and in line with those goals, it is my responsibility to blog my reflective process. So here it is! My first goal was to work towards modelling reflective practice through blogging professional learning (process and showcase) with the aim of encouraging an active blogging culture at ISB. I have stayed true to my word and I have used a variety of opportunities throughout the year to blog both process and showcase pieces. I wouldn’t go as far as to say that we currently have an “open and supportive bogging culture at ISB” although this was never going to happen overnight. As a part of my role on the Strategic Growth Initiative Committee, I established a blog to report back on our progress and engage an online dialogue beyond our meeting times. This has been relatively successful and I’m glad that we have a showcase piece to demonstrate the work that the group has completed so far. Since this committee will continue well into next year, this will remain a focus for me, and I will continue to engage the use of the blog to communicate feedback on the trial set to run in 2018. The more exposure (Middle and High School staff especially) have to blogging, the more aware they will be as to the advantages this style of communication and the more likely they are to look to embed such techniques into their own learning and the learning of their students. This is my tactic, to lead by example. In addition, a part of the professional growth trial for 2018-2019, staff will be invited to share their professional learning goals via their own blog! This is a huge step forward and has the potential to significantly change the way ISB engages with reflective practice. The professional learning blogs will house individual teacher goals and ongoing reflection – similar to what I am attempting to do in this space. It is hoped that over time, teachers will feel comfortable sharing their learning and reflection while inviting feedback and showcasing achievements. So have I achieved this goal, I’d say it’s still a work in progress and I plan to continue these efforts throughout 2018-19 and beyond. My second goal for the year was to model the use of DX through the establishment of a sustainable Digital Citizenship program for both Middle and High School. Given the nature of Digital Citizenship, this will never be one that I can say is finished. However, I’m pleased with the progress of the program at this stage, and using DX had meant that the resources are accessible for students and teachers at any time. I plan to continue to build units and add to these classes, so that there will eventually be a bank of resources for teachers to draw upon when needed. In the High School, there has been a change to the program for 2018-19 and Eileen will be responsible for developing the mentoring program. I’m looking forward to working with Eileen to establish a series of digital citizenship lessons that are built into the mentoring program, rather than as a stand alone entity, which was the case this year. I believe this will encourage a more meaningful experience for these students. In the Middle School, the mentoring coordinators have been great to work with and they have been considerate of building in the digital citizenship lessons as a part of the program. They’ve also reached out to me, when support has been necessary, and we’ve adapted lessons or built them for a specific purpose. Regardless of how proactive we are in our planning, there is always a time and a place for reactive measures when it comes to adolescents and their use of technology. The second part of this goal is to model the use of DX in an attempt to encourage a culture of collaborative online communities and the sharing of learning. As mentioned, DX has provided the opportunity to pull together units for this purpose and have them accessible at any stage throughout the year. There were some administrative issues with this set up – essentially, these grade level classes had to be created manually, which was a nightmare to manage. When a new student was enrolled, they had to be added manually by myself. In addition, there always seemed to be teachers that didn’t have access. I later discovered the mentor lists did not include the co-mentors so a good number of teachers were not added to the course. I need a solution to this for next year as it was time consuming to manage and I don’t believe there was ever a time when it was truly accurate. I’d also like to roll over grade levels each year, why take the time to set them all up again? I plan to keep the content and continue adding to it, so I need to look into this. The attempt to create online discussions with students (particularly in the high school) using the platform was not particularly successful – although I’m not sure they were necessary encouraged to do so, so it’s tricky to know where to go with this one. It’s clear that, similar to blogging, there is not really a culture of engaging dialogue in online spaces at ISB. This is certainly something that I plan to continue to model and showcase (while strategically encouraging it’s use during team planning and conversations with individual teachers!) in the hope of changing the culture and engaging more blended learning experiences for our students. I will need a lot of help with this one, mostly from the Elementary School to be honest. There needs to be better alignment between schools and Julie and I have the ability to work towards this in the Middle and High School, however, ensuring alignment with ES is more challenging. I think, in addition to our big picture goal setting for the Ed Tech team for 2018-19, we need to determine a more specific focus, perhaps aligned with a skill, that we attempt to engage with, where possible, in our classrooms, workshops, team planning, professional growth etc. For example, engaging online discussions, or reflective practice… what skill could we quietly model as a team next year and know that this is something that teachers and students across the school are being exposed to? So I was hoping that by the end of the year, the beginnings of a structured, relevant and engaging Digital Citizenship program, for Grades 6-12, is articulated, communicated and facilitated through the use of DX. I’d say this is the case and there is plenty for me to improve upon next year! VideoScribe – The Whiteboard Animation Tool! VideoScribe is a super great app for creating whiteboard animations. The application allows you to create fun, energetic and animated presentations without the fuss of having to draw on your own. The final product makes it look like you are drawing the illustrations and text – it’s impressive! Every time I’ve created and presented a VideoScribe video, I’m asked “Is that your hand?” – the answer, no! In addition to the simple and effective means to creating an engaging, scribed presentation, the app allows you the option to zoom out, at the completion of the video, and provide the audience with an overview of the story having just been told. This is an added bonus as presentations can essentially double as both video and print based media. This adds an additional challenge for students – What will my presentation look like in print? Will it tell my story without the need for audio or the structured flow of a video? Here is a short video, created using VideoScribe, that outlines the many benefits of using video as a powerful tool for communication, in particular, the effectiveness of whiteboard style multimedia. Wumian (Grade 9) working on his final presentation. 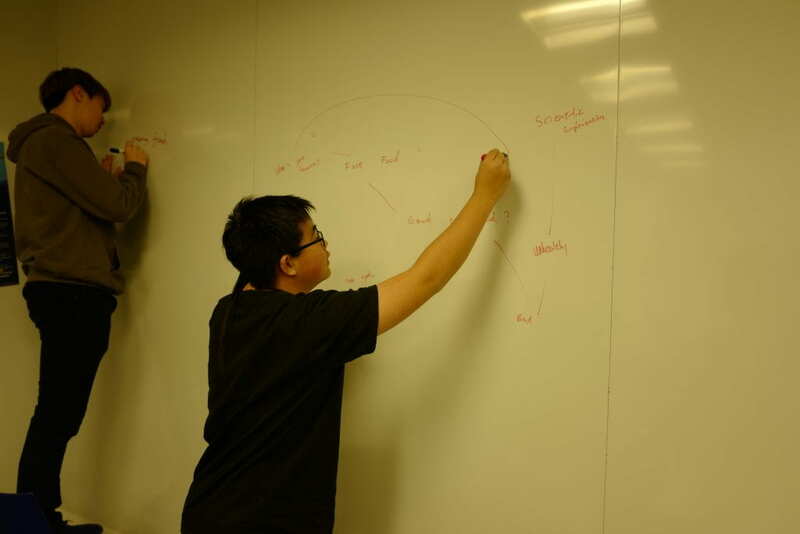 Jessie (Grade 9) planning the overall layout of his scribe. 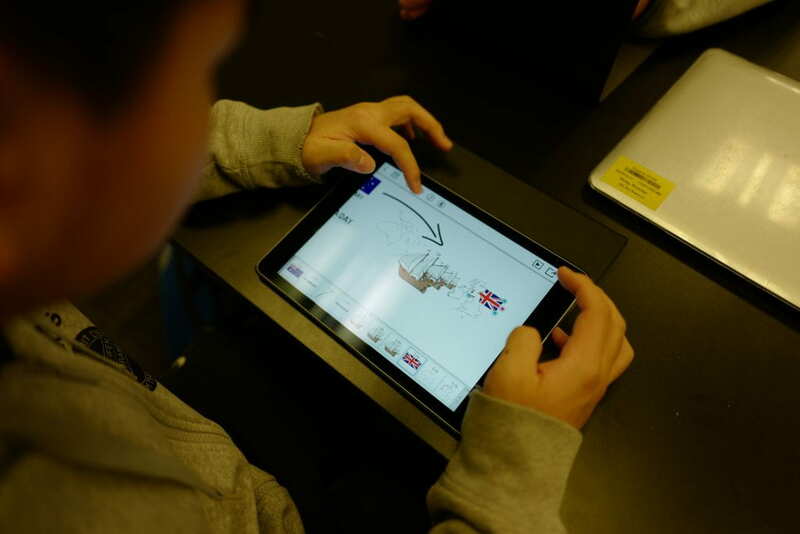 VideoScribe is now available on the iPads in the Middle and High School and will soon be available on the ES iPads. If you’re keen to offer this app as an alternative option for video creation, or perhaps use this app to create your own flipped learning content, let me know you need any assistance. The VideoScribe website offers a series of tutorials to help get you started. These include adding text and images, change draw and pause times, adding audio and soundtrack files, and publishing and sharing your scribe. I encourage you to give it a go! jlemley on Goal Setting – Is It SMART? Mr Hamada on Goal Setting – Is It SMART?